The most versatile magnetic pickup available today? 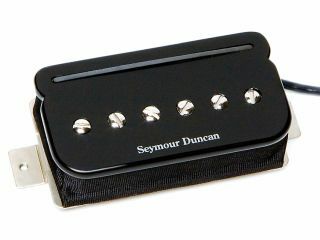 At Winter NAMM 2008, Seymour Duncan announced details of an innovative new humbucker-sized pickup that aims to offer guitarists ultimate versatility. Combining a P90-style single-coil with an Alnico V-powered rail pickup, the P-Rails can be wired to switch between humbucker and P90 sounds or humbucker, P90 and Fender-style single-coil tones. Designed by Duncan's Frank Falbo, the P-Rails is set to retail at £84.95, but Seymour Duncan recommends using a matched pair for the best results. Click here to watch a video demo from the official Seymour Duncan website.